"Silencer disarms and dazzles with its wisdom and full-throated wit. [This] collection snaps to attention with a soundtrack full of salty swagger and a most skillful use of formal inventions that’ll surely knock you out. Here in these pages, sailfish and hummingbirds assert their frenetic movements on a planet simmering with racial tensions, which in turn forms its own kind of bopping and buoyant religion. What a thrill to read these poems that provoke and beg for beauty and song-calling into the darkest of nights." 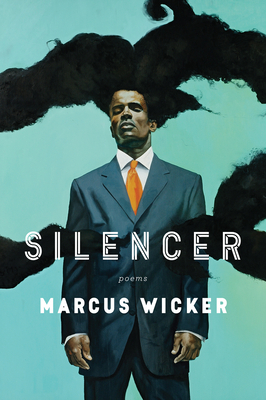 MARCUS WICKER, Poetry Editor of the Southern Indiana Review, is the recipient of a Ruth Lilly Fellowship from the Poetry Foundation, a Pushcart Prize, The Missouri Review’s Miller Audio Prize, as well as fellowships from Cave Canem, and The Fine Arts Work Center. His previous collection Maybe the Saddest Thing, a National Poetry Series winner, was a finalist for an NAACP Image Award. Wicker’s poems have appeared in The Nation, Poetry, American Poetry Review, Oxford American, and Boston Review. He lives in Memphis, Tennessee.